If photobiomodulation therapy can relieve pain and promote healing on the earths largest land mammal, Then it will work on you! You’ve tried some alternative treatments like acupuncture or Massage therapy, your Chiropractor has even used laser light therapy on your pains, but you just did not see the results you had hoped for. Maybe you just have tough skin. You are feeling out of options. You find yourself not enjoying things that you love, whether it is golf, hiking, grandchildren or just being pain free. The Pain reminds you every day that you are not enjoying life anymore. Relief seems a far fetched idea, so lets have an honest look at light/laser technology and why it may not have worked for you. Photobiomodulation (therapy with light) is not a miracle. Scientist have shown that light therapy of specific wave lengths, allows cells to begin the healing process faster and more efficiently by helping these cells create fuel and discard pain while reducing inflammation. It is not quite as simple as that, but you can understand that any healing process requires time for the cells to rebuild after damage. 1.) Initial treatment can take 8 to 30 sessions. Yes. According to the American Society for Laser Medicine & Surgery A steady course of treatment can initially take anywhere from 8 to 30 sessions for an treatment to be fully effective, often times requiring treatments to continue two to four times a week. 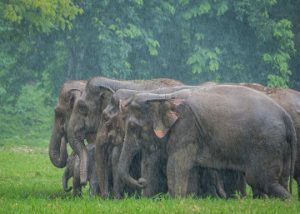 Of course the total number of treatments needed depends on a lot of variables, including the patients individual response, age, health, and the condition and the severity of the issue being treated. 2.) Treatments need to be done 3, 4, or even 5 days a week. Yes. In order to maximize the results and get the best out of the treatment, patients will need to visit the practice up to 5 times a week for 3-4 weeks for the initial treatment. Maintenance treatments may need to be done 2 or 3 times a week. 3.) Occasional Pain. Yes. Sometimes as treatment progresses, old conditions may resurface and it is not uncommon for issues to get slightly worse before getting better. 4.) Insurance providers, Medicare and Medicaid often do not cover expenses. Unfortunately true. Until we demand better health care options, including alternative and natural choices, and let go of our marriage with pharmaceuticals, the medical community will be slow in adopting less traditional treatments. Even with these disadvantages, the one thing that outweighs them all is that Photobiomodulation works to ease pain, reduce inflammation and promote healing at a cellular level and, it takes successive treatments to allow the cells to use the energy provided by the light to begin the healing process. In diseases like arthritis, light therapy helps the cells eliminate the chemicals causing pain, but will never really “cure” it, so once initial treatment is complete, maintenance doses may need to be continue. Multi Radiance Medical has been developing new super pulsed technology for almost 25 years, and is making medical devices safe enough for at home use, in an affordable, portable unit that is easy to use, FDA approved, and validated with independent studies, With more than 400k units in more than 30 countries, MRM technology is bringing healing and pain relief to patients that otherwise have limited resources. 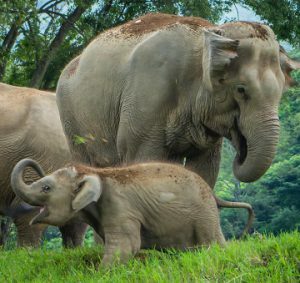 One of Multi Radiance Medical’s outreach programs is at The Elephant Nature Park in Chiang Mai, Thailand, where Elephants that have been victims of abuse, exploitation and land mine accidents, are rescued, rehabbed and allowed to live a natural existence. 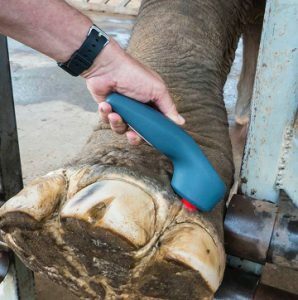 Because MRM Photobiomodulation units are cordless, it is easy to bring the treatment to the elephant. The proprietary synergy of three light wave lengths (660, 875 and 905) and a magnetic field, allow for the most effective depth of penetration for better cell response, while safely penetrating the thick hide and toe nails of this endangered species. 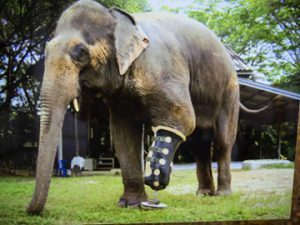 If these hand held devices can bring relief to the largest land mammal on the planet, imagine what they can do for your pain. All Multi-Radiance Medical Photobiomodulation units, from the most powerful 50 watt, that are only available to medical professionals, to the 25 watt, often used by Equestrians, and the 15 watt Pain Away / My Pet Laser, all use the same technology and same wavelengths. The only difference in the affordable 15 watt is the amount of power. Because of the super pulse technology, these 15 watt lasers are as effective as the larger models, and only require a few minute longer treatment to achieve the same results, and are available to you! Don’t be left out due to pain. get control of your life without pharmaceuticals, and get back in the parade. No more daily driving to your practitioner for laser treatments. You can laser your self in the comfort of your own home, while you watch TV, or while you read in bed, you can also use this same unit on your pets. Protocol manuals are available and a simple “cheat sheet” can help guide you in the proper setting to use for your aches and pains. I hope I have given you some food for thought and I hope you have more questions. If you would like to inquire about purchasing a unit for use in your home, please leave your contact information below and a qualified sales professional will contact your shortly. You can click here for frequently asked questions . If you want to know more on how to use these devices and how Photobiomodulation works, please click here . Take back control of your life. Learn how Photobiomodulation can help you, safely and in the comfort of your own home and with no side effects. Do you have a question as to how Photobiomodulation can help alleviate your pain? Please leave your inquiry here and a professional representative will contact you shortly. Elephant photos courtesy of J. Mark Strong, MRM Director of Global Business Development Human and Veterinary. I’d never heard of Photobiomodulation until reading your article. It is very interesting! Most folks in my family struggle with arthritis pain. I’ve suggested a few things from my own research and pain remedies, but ultimately it seems my folks don’t stick to the plan, such as drinking peppermint tea daily. Your therapy may be up their alley. My family isn’t too keen on taking pharmaceutical drugs, yet they often let their pain build and joints swell until they have to take them. Light therapy may be a happy medium for them between food-themed remedies and pharmaceuticals. Where can one purchase these devices? I believe the benefits of Photobiomodulation outlined in the 4 disadvantages you mentioned in the beginning of your post. I have seen many patients treated with medication for pain. The problem is rarely resolved and the pain continues to be an issues and medication becomes a way of life. The cost of years of treatment with medication is very high. Then the cost of dealing with the the side effects and life changes caused by pain medication can not be calculated. Any treatment that gets at the root for the cause of the pain is priceless. You are right, when you implied the pharmaceutical companies are one of the central reasons that alternative, non-drug treatments are so difficult to get. Thank You for your comments Christine. It is interesting to think that therapy with light was used by many cultures around the world for ages, until the discovery of antibiotics. This seems to be the point in which humans began to loose our connection to the earth and became owned by the pharmaceutical business. Hopefully the light is beginning to shine again and we will get smart enough to save our planet and ourselves.